When Revel and Roost opened in 2016 it was the first in many restaurants leading up Forbes revitalization out of Market Square. Nestled in the second floor of the new Hilton Garden Hotel Downtown the Roost gives a contemporary spin on fine dining. The concept of Revel and Roost is fine dining is Roost and Revel is more snazzy cocktail food. 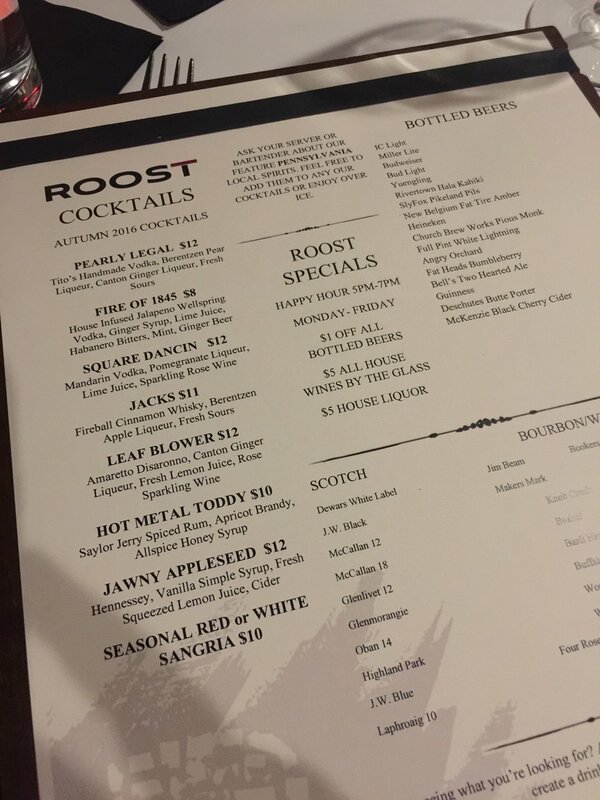 I love fine dining so I made a reservation at Roost and browsed the menu online. The atmosphere was contemporary and fun. My favorite part was the glass wine rack that went up the center of the room and served as a backdrop to the hostess desk downstairs and the backdrop to the bar upstairs. The seating was relaxing and while the table was small the meal was not rushed so the prime real estate wasn't filled or sloppy looking. There are larger tables however I was thankful that I got a window seat to look out at the city. We began with a bottle of wine. The wine list had a great selection with the prices ranging from $45 to $130. We chose the Ferrari Carano “Siena” from 2014. We decided on two appetizers with a cheese tray and Alaskan King Crab. The king crab was the long part of the leg and two small parts. There was a spicy dip with the crab, however, the leg was amazing without it. The cheese tray stole the show. 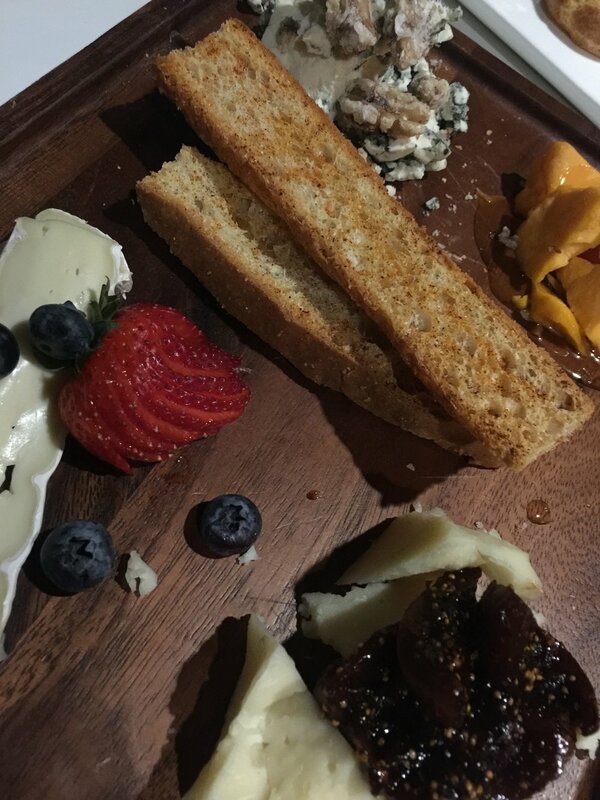 Some of the cheese on the board was cheddar with local honey, brie with fresh fruit and a blue cheese with candied walnuts. There was a crispy bread also on the board, however, there was also a plate of bread delivered to the table that we used for the cheese board. As a special at Roost they had an espresso and chocolate rubbed venison still on the menu for a few more days. Reordered that and the petit filet with scallops for the other dish. One of the few times I cleaned my plate at a restaurant. The petit filet came with mashed potatoes and beans and was topped with a garlic truffle butter. For dessert, we went in pairs again and ordered a brownie cheesecake and coffee and donuts. The coffee and donuts were three donut holes with vanilla custard and maple espresso glaze. 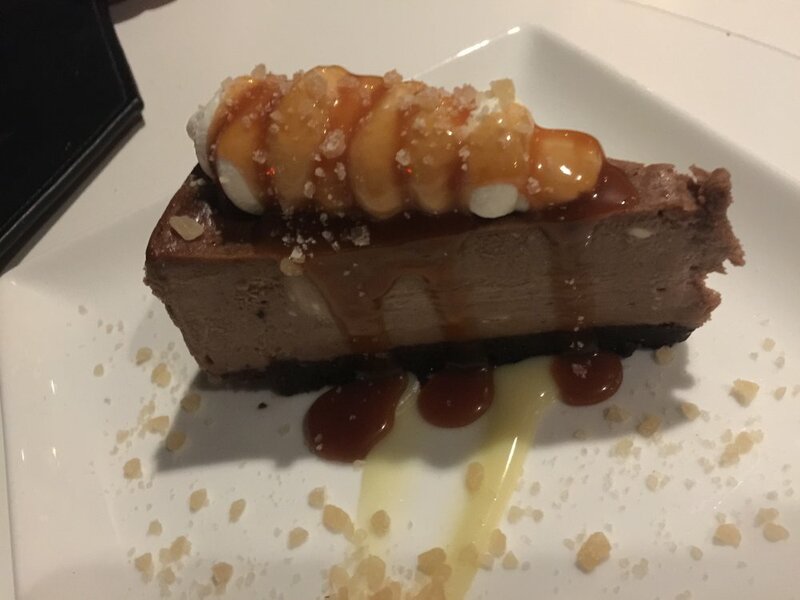 The fudge brownie cheesecake was rich a delicious. It was topped with whipped cream and caramel sauce. Check them out on Facebook and Twitter. Cheers!